Yes, I count myself among an elite few, the select group of wine wonks who never saw Bottle Shock. To recap for the other two of you, the 2008 flick semi-fictionalized events leading up to the 1976 "Judgment of Paris" that garnered fame for Chateau Montelena and other Napa Valley wineries. Missed it. I did see a promo photo in which the young, blonde intern cavorts among the vines. More than the fictional blonde, it was the fictionally neat, vertical, drip-irrigated vineyard that caught my eye. No one grew like that in the '70s! Imagine re-shooting The Grapes of Wrath except they're driving a Lexus SUV (might not be a bad pitch in this economy). Of course, viticultural accuracy has never been Hollywood's game. Remember A Walk in the Clouds? Quelle disaster! Take it easy, I'm not talking about Keanu Reeves' performance. Former attorney Thrace Bromberger and Gustavo Brambila, the real-life former Grgich Hills winemaker portrayed by Bottle Shock actor Freddy Rodriguez, fortuitously opened their tasting room weeks prior to the film's opening. Their phone rang off the hook for months. Now, it's quieted down a bit. Across the street from Napa's Oxbow Public Market, the spacious shop is filled with shiny baubles to enchant the tourist; but the gal charged with holding down the fort on rainy fall evenings was a down-to-earth industry local who made our visit fun and relaxed. I thought that Gustavo Thrace's 2005 Carneros Chardonnay ($35), with dominant notes of honeysuckle and butter popcorn reminded me of a more viscous Grgich Chardonnay. Brambila was Mike Grgich's assistant when their Chardonnay won that famous contest. But Grgich didn't sign off on the movie, so he was largely (and controversially) excised from the script. For his part, Brambila refused Thrace's "preview" lineup of Barberas specially selected before their first crush of that varietal; he just wanted to listen to the grape, and do it his way. With lip-smacking acidity and lush, not overripe black fruit, the 2006 Sierra Foothills Barbera ($30) is none the worse. The 2006 Green Valley Petite Sirah ($35), from Solano County's warm Green Valley, is a real stemware-stainer, a purple liquid of gorgeous black-cherry goodness. Brambila's Old World–style makes even more curious the silver robot standing guard in the shop. From photographs, at least, the winery's owners look like folks who have a good sense of humor. Maybe that explains why they distribute the Wine Pod, a machine about the size of an R2D2, that automatically makes wine; at least, it controls temperature, uploads data to a wine laboratory via DSL, and presses. What it doesn't do, apparently, is almost everything else. For $8,999, it could be big fun for an elite few, but I don't count myself among them. 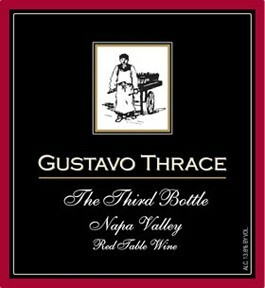 Gustavo Thrace, 1021 McKinstry, Napa. Open Sunday–Wednesday, 11am to 7pm; Thursday–Saturday, 11am to 9pm. Tasting fee, $10. 707.257.6796. Weekend alert: The wineries of chilly Carneros warmly open their doors for "Holiday in Carneros," annual food and wine pairings, music and special events that benefits local college scholarships. Saturday-Sunday, Nov. 22-23, from 10am to 4pm. $40 at the door of any participating winery, no advance tickets needed. For more info, call 800.909.4352 or go to [ http://www.carneroswineries.org/events ]www.carneroswineries.org/events.